Departure at 08h00 from the office and transfer to the CEASA harbor where you will take a speed boat to cross the river to Careiro village, passing by the meeting of the waters. Over there you will take a van for around 60 minutes until you reach a place called Paraná do Mamori where you will take the second speed boat to go to “JUMA LAKE CAMP HOUSE” which is the name of the lodge where you will be staying in this 2 days and 1 night. 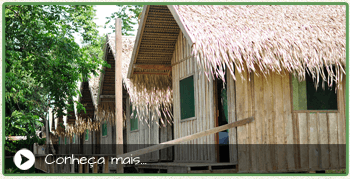 Arrival at 11h00, see the accommodations have lunch and after lunch you star the activities going for a canoe tour for piranha fishing, dolphin observation. Back to the lodge for dinner and after dinner, again by canoe you will go for the Cayman spotting where the guide will show you some big Caymans and after he will catch a smaller one to explain to you and if you want you can grab it to make some nice pictures. Back to the lodge and overnight. After lunch at around 14h00 you will leave to overnight in the jungle where you will learn about the night life in the jungle, try to see the animal that come out by night, learn some more techniques of survival in the jungle and spear fishing. In the morning you will visit a place where a caboclo (local people) will teach about the rubber process, how it use to be done many years ago. After lunch you make the same way back to Manaus arriving around 17h00. +55 92 3633-6507 / / +55 92 9105-5659.